This was a heart warming series about a huge, complicated, often troubled but functional family that included a widowed and remarried father and his eight very independent children. Then tragedy strikes the show, Diana Hyland dies in real life leaving the show without a mother. Only four episodes had been filmed at the time of her death, and not knowing how to handle it, the producers simply had her visiting relatives for the remainder of the season. 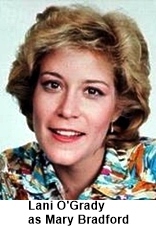 Then for the next season character Tom Bradford is suddenly a widower (presumably for over a year) and he meets a lovely school teacher Abby (Betty Buckley) who is a widower herself. Romance blossoms and all of a sudden the kids have a new mom. 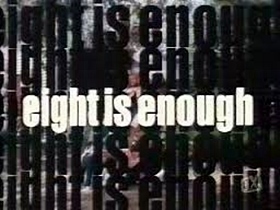 Billed as a comedy / drama the show dealt with the everyday lifetime experiences of some or all of the family and how they dealt with those circumstances. They were sometimes humorous and other times real tear jerkers. A couple of the kids got married, David to Janet Mc Arthur (Joan Prather) and Susan to Merle ‘The Pearl’ Stockwell (Brian Patrick Clarke). Mary went off to med school and came home a doctor and many of the other children introduced best friends, classmates and love interests expanding the cast and adding even more flexibility to the scripts. 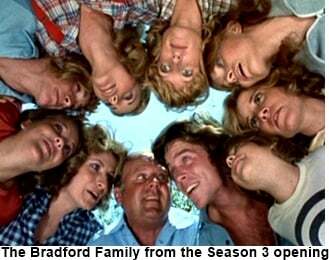 The show shared more than just the “large happy family” premise with the Waltons. Both shows were produced by Lorimar Productions and shared writers and creative staff. By the fifth season the ratings had started to sag and the show got caught up in an eight show purge by ABC. 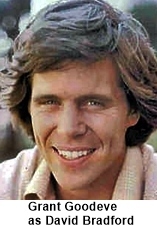 The series was based on a book by Thomas Braden titled “Eight is Enough”. Braden was a syndicated newspaper columnist who had eight children with the same first names as the tv show. Tom Bradford in the series was also a newspaper columnist but that’s about where the similarities stopped and the creative writing began.